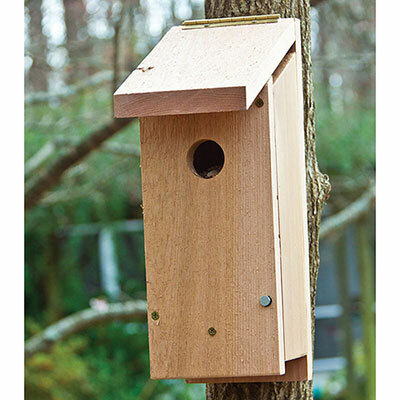 Constructed especially to accommodate Hairy, Downy and Red-Bellied Woodpeckers as well as Flickers, it has a 1-1/2" hole and the body is 14-1/2" long. Beautifully made of durable cedar and screws – no nails or staples! Hinged roof and side panel open easily for cleaning and monitoring; the box has proper ventilation and drainage, and wood shavings are included to mimic natural nest sites. Mount to a tree, post or any vertical surface higher than 12 feet. 14-1/2" H x 5-1/4" W, 9" roof.